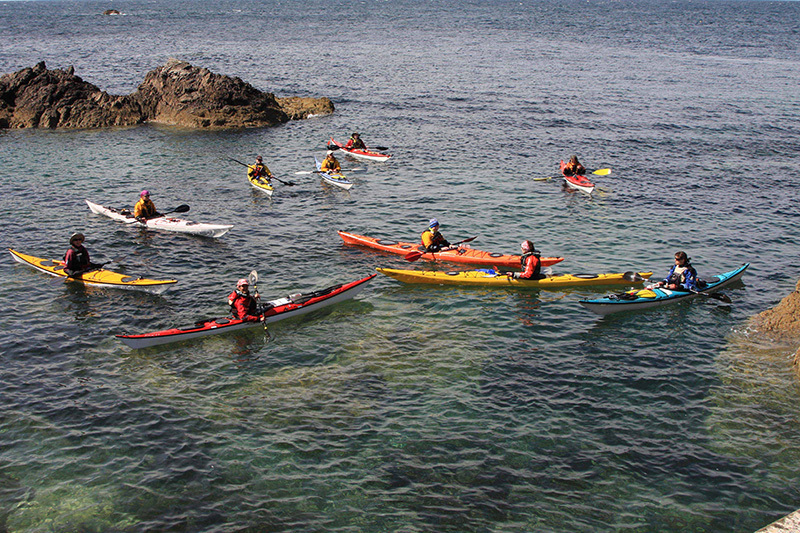 The Scottish Women Paddle Symposium was born in 2009 in a thunder clash of ideas. Mags Duncan, Tracey Sherrington and Morag Brown developed the plan of an event with women coaching women, where no one could hide behind each other (as we all do). The aim was to help each other reach the next level in their own personal boating achievements whether that is skill level, leading or coaching. A women only event can be off-putting for some but for others gives the opportunity to really grow in an environment that is supportive and understanding. The event offers opportunities to spend time in this environment and to network with the best female paddlers in all disciplines, not only from Scotland but with the best coaches from across the UK. As the event has grown so has the skills of everyone involved in the planning and organising of the event. Everyone gives their time for free and one outcome has been to pass on the event to others to develop longer term. Karen was one of the women who came along for the first time in 2014. She had never been to a symposium, or a women only event. Here is her story. 2014. The year I decided to take paddling into my own hands. As the mother of two young paddlers (boys) I seem to spend half my paddling life wondering where they are and what they are doing which means I am not spending nearly as much time focusing on my own paddling. What was I going to do to take paddling into my own hands? One day when I was on my local kayak clubs forum I spotted a flyer for a women only weekend. Not only was it a women’s only paddling event, it was also a multi-discipline event. What more could I have asked for: a weekend paddling on my own, an opportunity to improve my sea kayaking skills and a chance to test out my new surf boat all under the guidance of some of the best female coaches kayaking has to offer. The icing on the cake was the price at £60. Yes, I would still have to pay for travel and accommodation but still cheaper than two days with a private company. Sold! When the time came for me to go along I was a wee bit nervous as I was going on my own and I had no idea where I was going. Findhorn was up there! The A9 beckoned followed by some random B roads and not a toilet in sight when I needed one. I got registered, booked into my B&B and then spent some time meeting with some of the women I would be spending the weekend with. Day one and it was time to find the waves – surfing here we come. The group met up and jumped in the van and set off for the short journey to Sandend. We spent some time watching the water and doing some beach coaching before warming up and getting on the water. The water was a good level for beginners with only little waves, less than a foot high. The funny thing about those little waves is that they look so cute and innocent and yet lean in the wrong direction and it’s a North Sea bath for you! Practice, practice, practice and I was still not loving my new surf boat; a good spot by one of our coaches and a better fitting boat was found. Surfing was starting to happen. Personally it was a pretty mixed day; I love surfing, however, a slow start with my new boat left me not quite sure what my next steps were. The look on everyone else’s face said it all though. Surfing is awesome! In the evening it was dinner at the Village Inn, catered by the Kimberly Inn. Amazing! After a quick shower and change it was off the shop and to my delight not only did they sell non-alcoholic beer – it was cold. A roomful of strangers can always be a bit daunting but everyone was so buzzed after a great day that the room was alive with all the chatter of everyone’s adventures. The night was only made better with the good food and amazing deserts. A raffle, where everyone really was a winner concluded before we all bade our farewells and looked forward to saying hello to our beds. Day two and it was time to practice some 3 Star sea skills. The weather was great again and the views over the bay were sublime. Group sizes were small again with six paddlers and two coaches. It was a good day running over all the key strokes and using docked boats and buoys as obstacles and also a great opportunity to be reminded of good practice and to have those tips whispered in your ear as to how best refine your strokes. After lunch we practiced our rescues. I had the pleasure of rediscovering what has turned out to be the impossible to patch leak in my drysuit. I did ‘women’ up though and did the lot, even throwing in a roll to see if I could do one in a sea kayak – I can. The day finished with me being cold but happy. Before I knew it our day was coming to an end. It was time to get out of our paddling gear and help everyone get their boats on their cars. A final cuppa and then it was time to drive back down the road. It was a great weekend; a weekend to reconnect with myself and time to connect to other women who share my passion for paddling. It was different. I can’t define how, it just was. Was it because it was an all women event? Was it because the coaching style was different to what I was used to? Was it because the support provided was different to that provided by men? I don’t know. I haven’t quite managed to work it out yet. What I do know is that I enjoyed it and not only did I learn more I tiredly drove down the road feeling confident in my paddling ability.